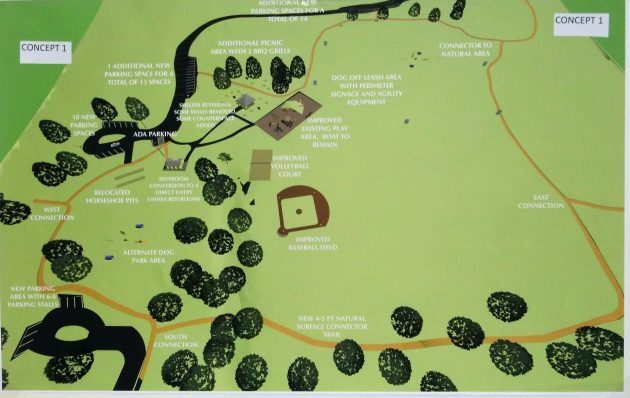 Looking at one of the concepts for improving North Albany County Park. The good news is that the boat remains. The bad news in the planning for upgrading North Albany County Park? Well, as near as I can see, there isn’t any bad news in the concepts unveiled during a community meeting Thursday night. Benton County officials presented park proposals to about 60 people, including North Albany residents and a number of Oregon State University students, at North Albany Middle School. 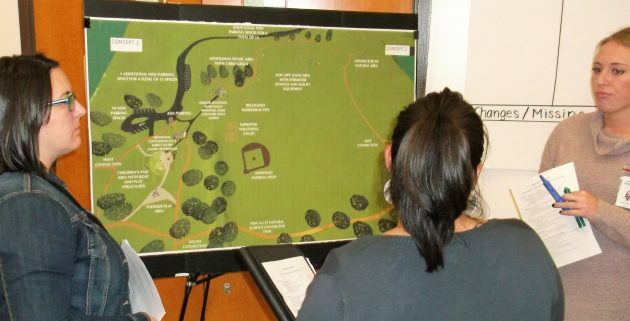 The students are helping in the effort to come up with a new master plan for the park and a nearby 10-acre wooded area that was donated to the county. Three slightly different concepts for reconfiguring the park all call for modernizing the playground. 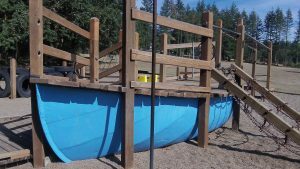 One would leave it where it is, and two would move it, but all three would retain the boat that’s been fun for young seafarers for many years. The boat will survive the planning storm. One of the concepts would create a new six- to eight-car parking area on the south side, accessed from Grandview Drive where only pedestrian and bike access is possible now. All three concepts call for 10 new parking spaces around the loop at the end of the existing access road. The planning so far also calls for better access to all facilities for people with disabilities. The restroom would be converted to four “direct-entry unisex restrooms.” Also, there’s to be a 4-foot-wide, natural-surface trail around the park perimeter, great for a few rounds of exercise by walkers or joggers. Exercise and healthful outdoor activity are among the main points of the park, which is why the county health department, in the person of health policy specialist Sara Hartstein, has been a leader in the planning. Other contemplated improvements: Better volleyball and baseball fields, an area for dogs, fenced or not depending on where it ends up; modifications at the shelter, a new picnic area nearby, and LED lighting. In the wooded natural area, there’s to be an entrance off Crocker Lane and a trail through the trees, along with a connecting path to the park itself. The master panning is to be finished in December. After that, the timing of building the improvements will depend on funding. Parks director Jeff Powers told me the restroom and other work will require around $300,000 or more. The first projects likely will be related to improved access for people with disabilities. People can keep track of the planning process online here. This version shows an access and small parking area on the park’s south side. HH, thanks for the update!